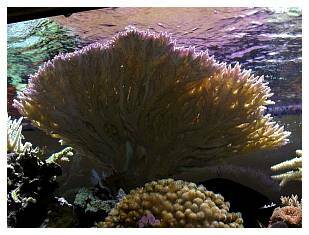 Five years ago when I saw a reef aquarium for the first time I never imagined that one day I would be sharing the experience of my own tank with all of you. At that time, I was based in Singapore, where people are very good at putting together beautiful systems. I was bombarded with beautiful tanks at shopping centers, airports, offices, you name it, and every time I saw one I wanted to have my own. Little did I know the level of involvement, learning and all kinds of new skills required to do the job. Upon returning to the United States and while looking for a new home, I had already decided that the house had to (yes, HAD to!) 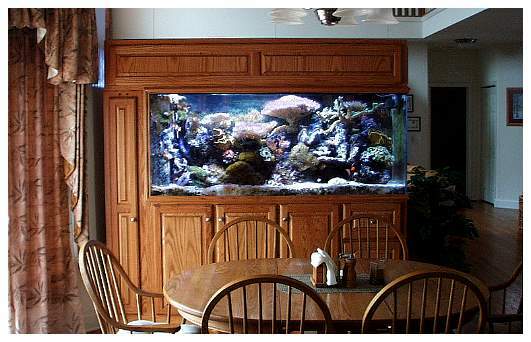 include a reef aquarium. Having found a new house that still required some work before its completion, I took the opportunity to do some advance preparation, but not without first passing the hurdle of "consulting" with my dear significant other (please don't ask for particulars). so many options! There were so many decisions to be made, and I had not even started yet. My first step was to determine a general outline and work from there. 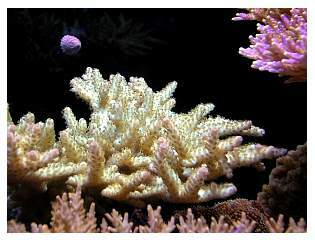 I started educating myself, reading as much as possible, getting books, looking at websites such as Reef Central (which became my favorite consulting source), learning about other systems, visiting others' tanks from which I could get ideas and, of course, asking a lot of questions. a) It would be a bay unit that would stand as a divider between the family room and the breakfast area. b) I would prefer as large a tank as possible within the allotted area, for maximum stability. c) All peripherals would be located out of sight in the basement equipment room. d) The stand's and canopy's finish would have to match the rest of the house's furniture and cabinetry. After preparing some designs and drawings, I took them to the same carpenters who had built our kitchen cabinets. They were very good and diligent, and I really liked the job they were doing (well, at least until close to the end when I saw their bill). Finally, this is the collection of goodies I came up with for the system that has been up and running for slightly over two and a half years. 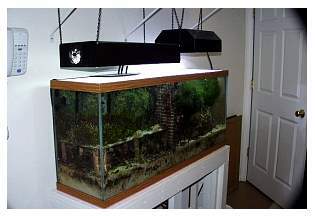 55-gallon glass tank on a DIY stand with a total of 285 watts of lighting: 10K metal halide and power compact lighting. 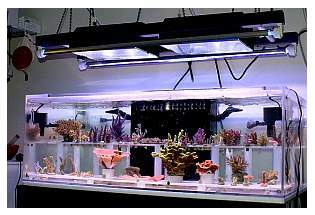 70-gallon acrylic tank, 48" long by 24" wide by 14" deep with two 250-watt metal halide14K bulbs and two T5 actinic bulbs powered by electronic ballasts. 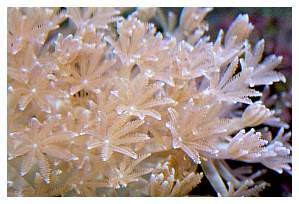 Left: fragment grow-out tank. 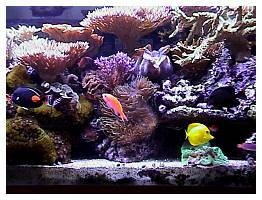 Right: refugium. 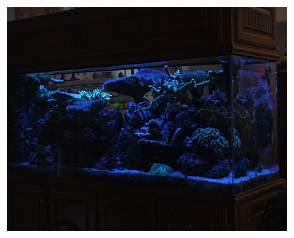 29-gallon glass aquarium with one 250-watt metal halide 10K bulb, a CPR Back Pak skimmer, a canister filter and a 9-watt UV sterilizer. Top left: General view of the basement equipment room. 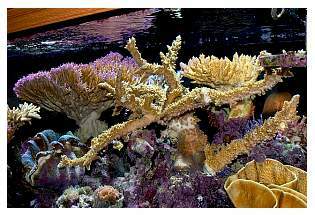 Top center: Aquacontroller located under the tank. 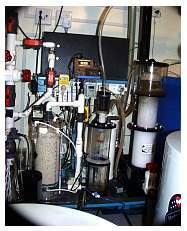 Top right: calcium reactor. 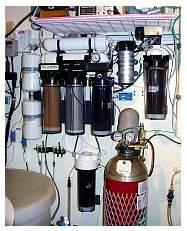 Bottom left: RO/DI filter. Bottom center: ETS skimmer. Bottom right: UV sterilizer. Soon after receiving the equipment I realized that the allotted space was going to make it a really tight fit. I measured all of the equipment's footprints, cut some pieces of paper to scale and started trying to move things around to test fit them. After trying several permutations, a couple of things became obvious. 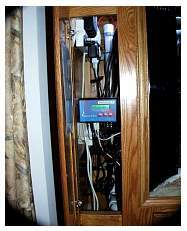 First, the equipment would not fit unless shelves were used. 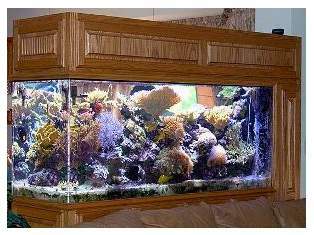 Second, a 40-gallon sump would be too small to meet the system's requirements. It would be difficult for the skimmer to do a proper job if it were on a shelf, so I decided to use an additional 37-gallon pre-sump with an overflow to feed the skimmer. Left: Geo kalkreactor. 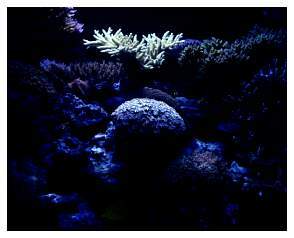 Center: saltwater mixing container. 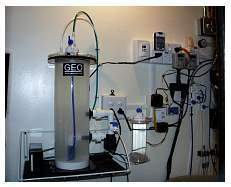 Right: ozone generator. After getting the equipment arrangement out of the way, I started preparing the site. I began boarding the walls and waterproofing the surfaces using primer and an oil-based alkyd paint. 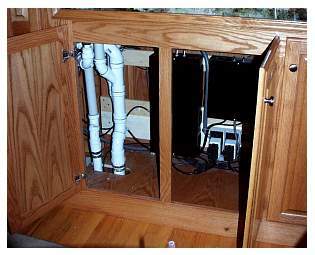 Additionally, I built a wood box on the floor which I covered with fiberglass and connected it to a drain that would act as a receptor for any potential leaks from the sumps or equipment on the shelves. Inside the box I installed the shelves and padded pump mounts that were also sealed and painted. Then it was time for the next step. 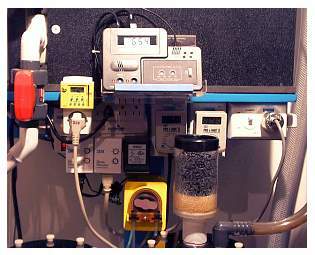 Left: Doser and pH controller. 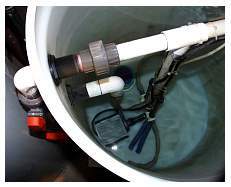 Right: Drain and return lines and ballasts located under the tank. Having defined the location and electrical loads of all the equipment, I proceeded to mark the locations for the plugs, GFCIs and power switches required to take the equipment out of service for cleaning and maintenance. Also, with the local electrical code in hand, I selected the wire gauge to use. I was really surprised at the number of boxes, switches, power strips and the total amount of power required, so I decided to run a second circuit and split the load between the two. This new dual circuit design required an X-10 signal bridge and amplifier, which also gave me the idea of installing an emergency shut-off system. Additionally, since it allowed me the option of using 220 volts for the heavier loads, I decided to install both 220 and 110 volts for the main lighting as well as for the main return pump. For purposes of easy installation, maintenance and possible expansion sometime in the future, I decided to use surface mounted boxes and conduits. After a couple of weeks and multiple trips to my favorite hardware supplier, who started calling me by name, the electrical system had been completed and tested. By then I was basically living in the basement, so it was time for a break to mend spousal relationships. Well, with the equipment in its place, the lengths of piping, hoses and tubing needed were well-defined, but how did you say you glue this thing together? After some bloopers, trials and errors the piping began taking shape, one piece and fitting at a time. Some modifications had to be made on the fly and some more valves were added to ensure that each piece of equipment would be removable even while the system was running. The finished stand arrived and the tank was put into place. That day I think I looked like a dog with a fresh bone. Well, more like a kid in a candy store. Of course, by then the hardware store manager walked up to me to say hello every time I went into his store. I was also making a lot of friends with online vendors. 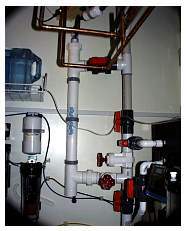 Oh, yes, another tip- If you're planning to glue a lot of fittings and pipes, be sure to vent the area well so you do not end up with a speech impediment, red eyes and your kids telling funny stories about you! so far. After running for several minutes, the water leak alarm went off! I ran to the basement and found a surge of water spraying everywhere! Did I mention a drip box connected to the drain? I never thought it would serve its purpose so soon. Well, I had the opportunity to test the electrical system's and walls' waterproofing, to say the least. After the system shut off, I discovered that I had overtightened the fittings onto the chiller's PVC adapters and they had burst open. After replacing the fittings, I refilled the lost water and ran the system for a couple of days. I started taking notes of all the bugs that needed repair or modification. I fixed the noisy drainpipes and cooling fans, and replaced the main pump with a smaller one because the original pump pushed 3500 gph, which the overflow could not handle. 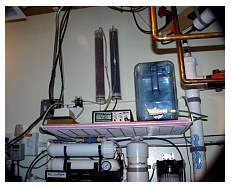 I installed overflows in the pre-sump, installed X-10 noise filters in the PC lighting plugs to solve electrical interference problems, and replaced a couple of defective GFCIs that kept tripping under a normal load. I installed support bars to the canopy doors (which fell on my head a couple of times), forced ventilation in the equipment room to get rid of the excessive moisture, an outside air inlet for the skimmer, replaced the heavy wooden canopy covers with eggcrate, installed a check valve in the main return lines and drilled anti-siphon holes, two spray bars (which I removed six months later for added circulation) and tested various controller software. Oh, I almost forgot; I was getting a bit tired of TV dinners and sleeping with the rabbits (our other pets), so I went back to some more quality family time again. 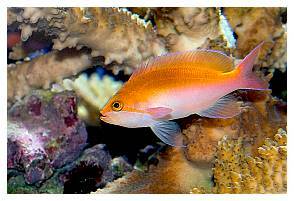 The Equipment Does not Make the Aquarist! After a couple of weeks of smooth operation, it was time for the fun part: stocking the system. And I thought the installation had been difficult! 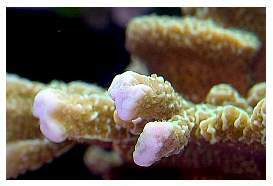 I ordered 300 pounds of a combination of dry and live aragonite sand and drove my truck to the reef farm, from which I was lucky to be only an hour's drive away. I was allowed to hand-pick 330 pounds of cured live rock. I got a combination of Fiji rock, Tonga plate (great for caves) and Tonga branch rock. I used about 45 PVC couplings with drilled sides as stands for the rock. 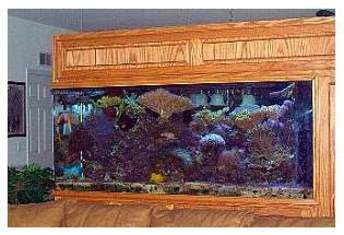 I wished the tank was wider than 24"; it was not easy to accommodate that much rock and still leave space for optimal two-sided viewing. After the rock was in place, I half-filled the tank with salt water and proceeded to pour the wet sand onto the bottom using a powerhead to blow it under the rock and to cover the PVC couplings acting as support poles to raise the rock off the bottom. Against all recommendations I had washed the dry sand, so I initially got very little turbidity. After running for 12 hours and emptying the skimmer a couple of times, the water was crystal clear. 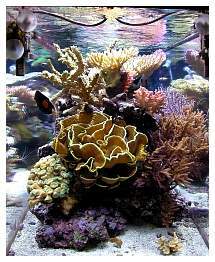 Thanks to the cured rock and how fast it was transferred into the new system, and with the additional help from the bacteria in the live sand, the ammonia never spiked. In any case, I let the system run for a month with only a minimal clean-up crew. Foraminiferwhat? Yes, those little red sharp thingies. What does "Aptanasia" have to do with this? She might have been the discoverer, so those things might have been named after her. Now what? Brown algae? 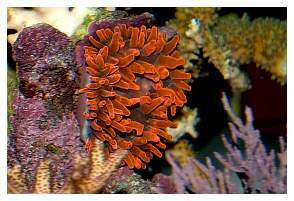 Red algae? Green algae? 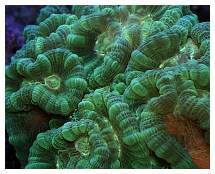 "Tutti Fruiti" algae? What did you say they were? 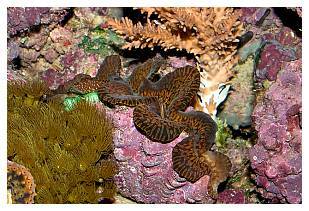 "Flathelminthes?" A hairy thing? (Certainly, not my head). How do you pronounce "Refugio?" So many names to learn and remember; this was a totally new language for me to fathom. There were many sleepless nights spent dreaming of pests and crawling, clawy monsters. So much more to learn and so fast. Well, it shall be easy to do if you have the Doctor's forum and an elephant's memory. Time for learning one more skill: the calcium / alkalinity / pH balancing act. Back to the reading and the books, more questions and system adjustments before the tank finally achieves some stability. 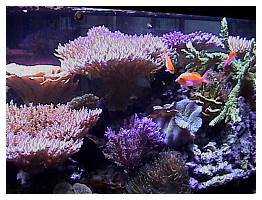 The propagation tank and refugium are on a reverse daylight cycle. 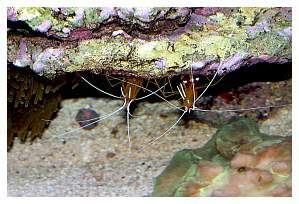 Chaetomorpha is used for additional nutrient export. 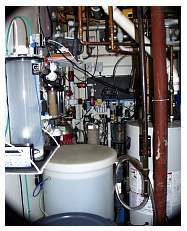 The ultraviolet sterilizer runs continuously. I would say that, although I did a lot of planning of the equipment and its installation, I was a bit lacking in planning the species I wanted to keep. 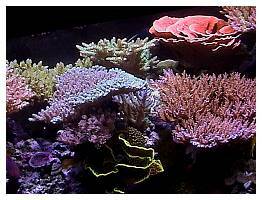 As commonly seen, I tried to start with easy to keep soft corals, which over time have been replaced by a bit more challenging large polyp and small polyp scleractinians, eventually ending up with what could be defined as a mixed tank. 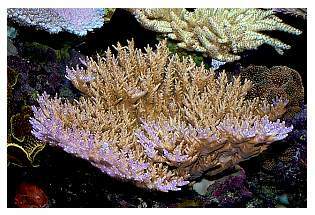 As of today most of the soft corals are gone with the exception of some beautiful Red Sea Xenia and those dreaded zooanthids that spread so rapidly that I have a hard time keeping them in check. 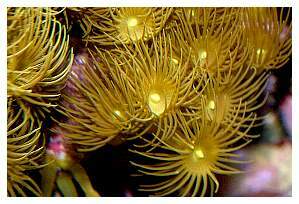 Several species of zoanthids, Yellow polyps and Palythoa sp. 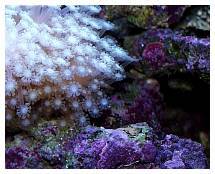 Red Sea white Xenia sp. 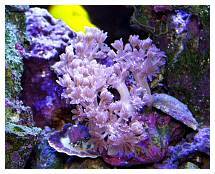 5 different color colonies of Ricordea sp. 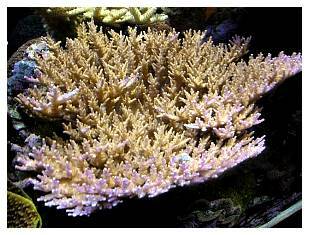 Pink and blue table Acropora sp. 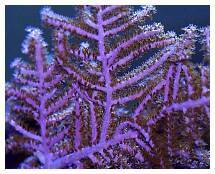 Purple bottle brush Acropora sp. 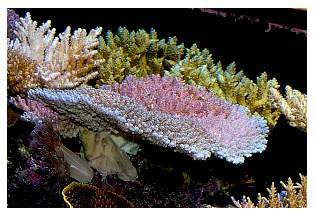 Some more species of pink, yellow and purple-tipped Acropora sp. 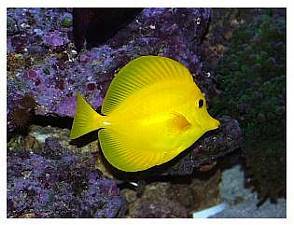 I have had many of my favorite fish since the start up of the aquarium. Unfortunately, some were lost for unknown reasons and a couple were lost due to my inexperience. Yes, some carpet surfing occurred despite the covers; those blue-spotted jawfish seem to be skilled at finding even the smallest holes. 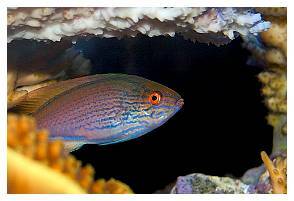 The fish all behave pretty much like good citizens, keeping to their own space, and they have learned to respect each other's space. 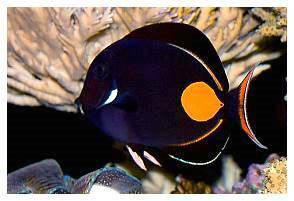 Once in a while the Achilles tang, which I call Attila given its character, will flash either the Chevron or the Yellow tang when it gets too close for comfort but usually just parts away to continue with his grazing. The Chevron tang, which was once a very attractive orange with purple reticulate, has grown to be a very dark brown with dark olive-colored stripes. 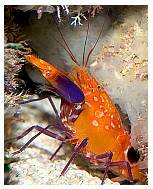 Although not as spectacular as he was when small, he is such a good grazer who keeps the aquarium completely algae free, and I am thankful to have him. almost). 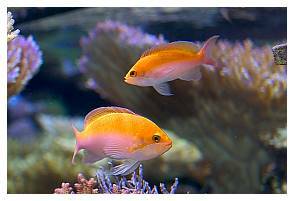 The Anthias are particularly fast swimmers and are always sharply attentive to their surroundings. 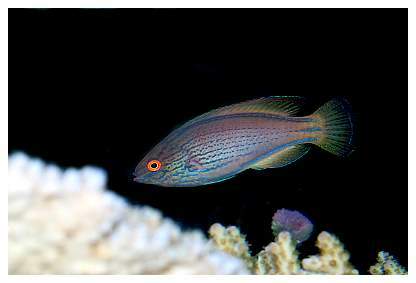 The wrasses are constantly intent on carefully observing the rockwork and corals for little critters for dinner. It's really a wonderful sight to behold. 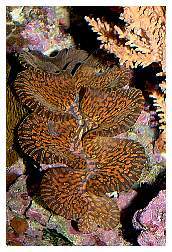 A gold striped purple-rimmed Tridacna derasa. What a way to grow!!! 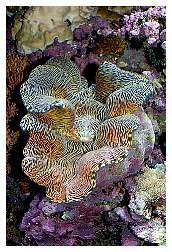 A bit of advice: I would not recommend testing the responsiveness of your clam by touching the mantle with your index finger, especially if it is a large clam because an unpredictable chain of events may develop... Yep! It closed suddenly and my finger was trapped for two minutes while my wife observed nearby laughing. Ouch!!!! Cut deep to the bone. 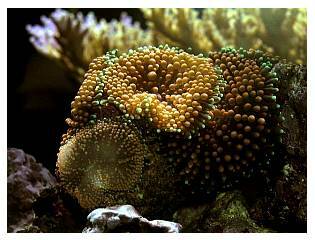 Two green bubble-tip anemones. 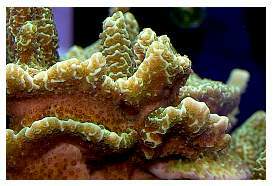 The original one split several times to produce about five clones that I was able to take to my friendly LFS. Some sand-sifting starfish and a nice burgundy Linckia, which is growing nicely. naa!" He has learned all the tricks by now. 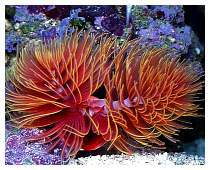 The rest of the bestiary includes a couple of beautiful three foot long blue and white bristle worms (beauty is in the eyes of the beholder) and countless numbers of various worms, as well as mini stars, pods, mini feather dusters and sponges. "Honey, Can we Go Out?" Have you ever really thought about all the things we do to keep things running? When I made this list, I could hardly believe it. 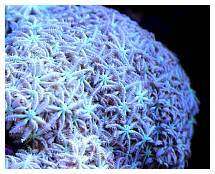 Feeding: I usually feed once a day, late in the evening when the actinics are still on. I feed a couple of pinches of flake formula and half a Nori on a clip. Once in a while, I drop a pinch or so of granules into the refugium and add some vitamins and garlic to the Nori. 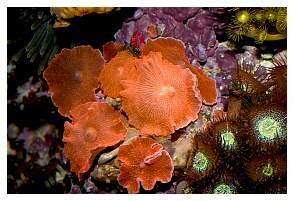 No special feeding is supplied to the corals or anemones. 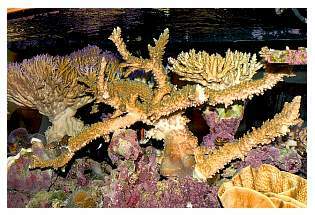 Check temperature, pH and ORP, observe the corals, fragments, fish and visible critters for signs of sickness, damage and such. 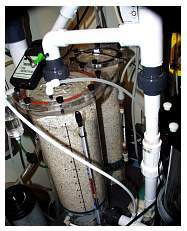 Quick check of the equipment: check the pumps for any change in noise or vibration, the sump's water level, the calcium and phosphate reactor's operation, and empty the skimmer's waste collector, if necessary. Check the wireless connection, controller's operation and proper uploading of data. And, of course, check the forums and threads once in a while. If required, get rid of some Aiptasia. Dissemble and internally clean the chiller, check its refrigerant and recharge, if necessary. 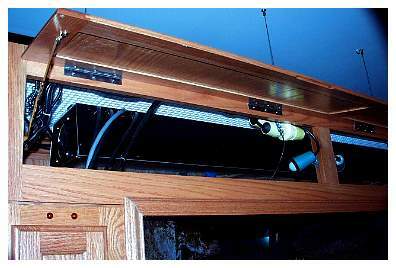 Inspect heater's and powerheads' wiring for damage and cracks; replace if necessary. Who Can we Count on for Support? As with everything that's worth something, there have to be good times and hard times. 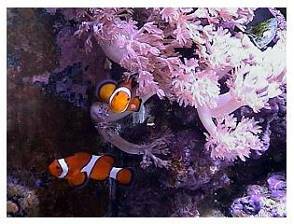 It is always heartbreaking to see one of the fishes you have become so attached to, become sick or die. 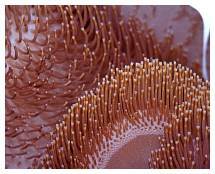 To see your system invaded with cyanobacteria, hair algae or see the cycles of Ich on your fish can be really discouraging. Despite how hard you clean, change things or parameters, or apply every suggestion you can find, the problems seem to hang around forever until you reach the point of wanting to quit the hobby. If there is something this hobby has taught me, though, it is to be patiently systematic. 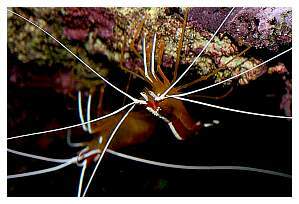 Eventually, I have been able to resolve problematic issues thanks to the support, teachings and assistance of the whole aquarium community. I have been a member of various clubs with other hobbies whose so-called experts acted more like "prima donnas" looking for reverence. I can only be grateful to the people who make Reef Central's level of support possible. 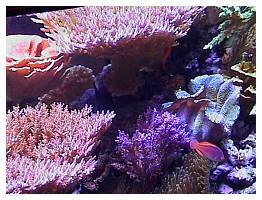 I mean experts who act like real aquarists and dedicate their little free time to help and research for fellow aquarists (yes, moderators included), and who have helped me with their comments and suggestions, and the many excellent and honest vendors and store owners I have come across in this hobby also, without forgetting the patience of my wife and kids. 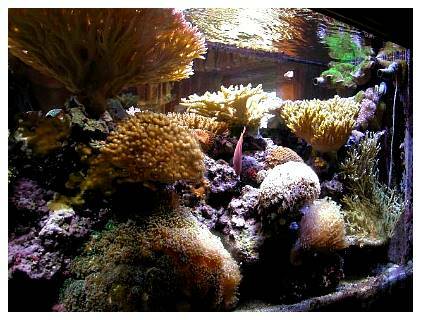 Additionally, many thanks to Erik Carrillo and Bill Chamberlain for their wonderful photos of my tank and livestock. Thank you, everyone! Thanks for making this more than just another hobby. Photos courtesy of Jose Dieck, Erik Carrillo and Bill Chamberlain.